Undead Horde is a necromantic strategy RPG from 10tons Ltd. Become a necromancer and raise the dead. Maraud through the lands of the living, raze their villages and steal their treasures. Battle against the living who’ve driven the necromancers and their undead minions into exile. Re-animate all kinds of creatures and build an army of up to 100 undead. Ultimately you’ll take over the whole kingdom of the living. Command a horde of Undead minions and unlock new minion types by slaying your enemies. There are over a dozen minions ranging from human archers to venomous scorpions. As a necromancer you can raise your slain enemies as undead warriors. You will also summon undead from your crypt. Graves may offer supring reinforcements whenever you find them. Improve your Necromancer and minions with items. Items can be found as loot or bought from stores. Procedural item generation provides endless amount of new and exciting items for the necromancer to play with. 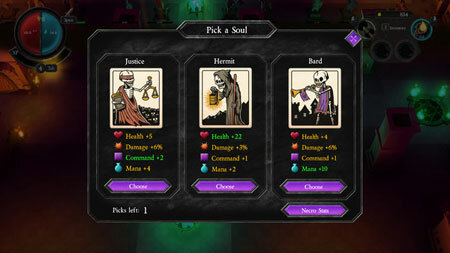 Necromancer gains XP by killing enemies, completing quests and raiding the villages of the living. When leveling up, they can choose a soul to absorb. Each soul types gives different boosts which range from increasing command cap to melee damage. You will conquer back the lands the living stole from you. Making your way through forests, deserts, and wastelands you will finally destroy the King Paladin Goodhelper. If you get stuck in the game, check out the video walkthrough and gameplay for the game. This entry was posted in PC Games, Walkthrough and tagged Undead Horde Cheats, Undead Horde Gameplay, Undead Horde Guide, Undead Horde Strategy, Undead Horde Tips, Undead Horde Walkthrough by Marvin. Bookmark the permalink.